Muslim Brotherhood to begin fresh protests starting Friday, in preparation for the first court session in Morsi's trial. Egypt's Muslim Brotherhood will begin fresh protests starting Friday, in preparation for the first court session in the trial of ousted Islamist President Mohammed Morsi, Al-Ahram reported on Thursday. Morsi, who was ousted by the military in July, is charged with inciting violence. The National Alliance to Support Legitimacy (NASL) renewed the call for protests in a statement Thursday in support for Morsi, whose trial is to begin on Monday, November 4. Supporters of Morsi have been staging near daily demonstrations calling for his reinstatement since he was deposed by the military. 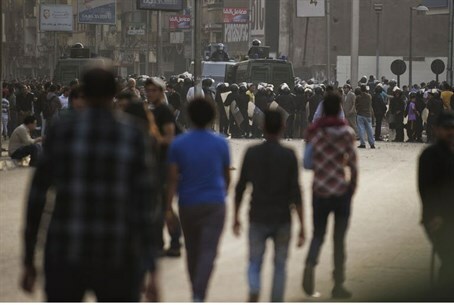 Demonstrations have often resulted in clashes with security forces and residents against the Brotherhood. This week's protests mark another test for the Muslim Brotherhood, whether the movement can keep a presence in the street as a means to pressure interim authorities. If Morsi is present in court it would be his first public appearance since July. Since being deposed, Morsi has been kept at an undisclosed location, with no access to the media or his supporters. In their statement, the NASL claimed Morsi, "the forcefully kidnapped legitimate president," is being "deprived of his legal rights." Morsi has rejected the authority of the court that is due to try him. The NASL intends to stage a week of protests, including showing up in front of the court on Monday, and for supporters to protest in front of Egyptian embassies and consulates worldwide, reported Al-Ahram. Security forces launched a massive crackdown on Morsi's supporters in August, violently dispersing two protest camps in Cairo. More than 1,000 people have been killed since Morsi's ouster - mainly his supporters - and the authorities have arrested some 2,000 Islamists, including most of the Muslim Brotherhood's leadership.